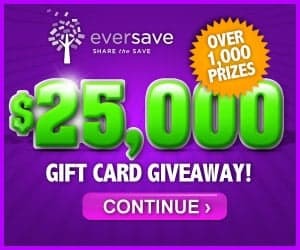 Eversave is currently hosting a $25,000 Gift Card Giveaway with over 1,000 gift cards to be won! The Grand Prize is a $500 Amazon Gift Card. The contest is open to USA only and ends May 31, 2013. Visit Eversave to enter.